Winchester Hospital’s cancer support services include a nurse navigator as well as various support groups and A Caring Place, a retail store that sells specialty products to help provide comfort to cancer patients. 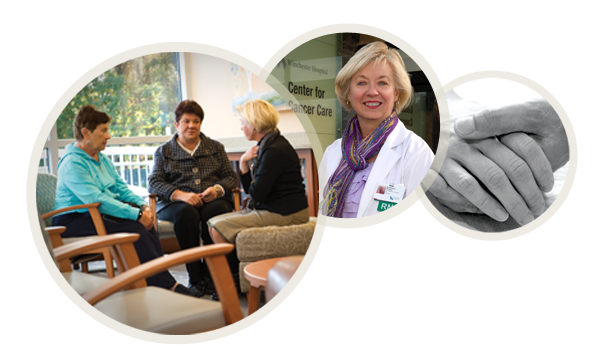 At the Winchester Hospital Center for Cancer Care, we offer a dedicated nurse navigator, a specially trained and experienced oncology nurse who provides supportive guidance and care for each oncology patient through every step of their journey. In addition, our experienced social workers to help connect patients to the services they need while they are being treated for cancer. A seven-week (one evening a week) breast cancer support group for newly diagnosed patients that runs three times a year at the Winchester Hospital Breast Care Center. Learn more about our cancer support groups. Winchester Hospital’s Cancer Rehabilitation STAR Program® (Survivorship Training and Rehabilitation) is a nationally recognized program focused on improving the lives of people who have side effects from cancer treatments. Services include consultations with doctors, rehabilitation nurses, nutritionists, and physical, occupational and speech therapists. Conditions treated include pain, weakness, fatigue, shoulder problems, balance and gait problems, memory and concentration issues, swallowing and speech problems, and lymphedema. Learn more about the STAR program. Cancer home care – Winchester Home Care, affiliated with Winchester Hospital, offers nursing care, physical therapy, occupational therapy, speech therapy, medical social work, social services and home health aides. We can help you get the care and help you need in order to remain in the comfort of your own home while you are being treated for cancer. Cancer palliative care – This is specialized medical care focused on providing patients with relief from the symptoms, pain and stress of a serious illness, such as cancer. The goal is to improve the quality of life for both the patient and his or her family. This service is provided in collaboration with the Hospice of the North Shore and Greater Boston. Cancer hospice care – Hospice manages symptoms and enhances quality of life in the last months of a person’s life. The philosophy of hospice is that each person has the right to dee with dignity and pain free. This service is provided in collaboration with the Hospice of the North Shore and Greater Boston.